The rightward shift in the United States political world that has been growing for decades is not a reflection of the wishes of the majority. It is, in fact, the fruition of the efforts of “libertarian” economists and their wealthy funders to permanently alter U.S. governance and bring an end to majority rule democracy. 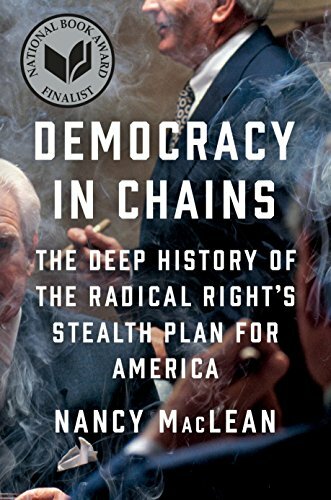 Through meticulous research, author Nancy MacLean demonstrates how these economists, led by James Buchanan, who define liberty as the freedom for markets to operate unfettered by any restrictions whatsoever, have been funded liberally by corporate executives, most notably Charles Koch. The desire to free companies from any and all federal regulations mandating such things as collective bargaining, pollution controls, minimum wage, and fair taxation is and has been the goal, and this group is succeeding. One of the major thrusts has been to end Social Security, traditionally one of the most highly supported social service programs in the country. Knowing that attacks on this program would not immediately succeed, those wishing to destroy it recognized that they must first discredit it. This is being done by subtly attempting to convince younger workers that they are paying too much to support the elderly, and by claiming that funding for Social Security is in deep trouble. Therefore, it is said, by privatizing Social Security, people can invest their own money, rather than depending on an “unreliable” government program, or needing to support people other than themselves. Of course, the companies in which this money would be invested stand to profit handsomely from this proposed change. Climate change is another target; this is attacked in part by stating that climate change scientists are self-serving, commanding huge salaries to write and speak about this “myth.” By 2014, only 8 of 268 Republicans in Congress would admit that human activity had an impact on climate change. They vote accordingly, removing, whenever possible, any regulations mandating limits to air and water pollution. Taxes, it is claimed, cause the “makers” of the country to support the “takers,” those who, they say, simply want to remain on the government dole. This category includes the homeless, the unemployed, veterans, the elderly, and the handicapped. The assault on labor unions, under the mask of “right to work” laws, seeks to eliminate the gains that collective bargaining has brought to workers for nearly a century, and certainly to prevent any future progress. The Draconian regulations passed by Wisconsin Governor Scott Walker are an excellent example of the success of this insidious program. Restriction of voting rights is a key component of this plan; if the poor can be prevented from voting, the will of the wealthy white elites is far more likely to be implemented. Attacks on voting rights have increased across the country. The architects of this new world order are clear on their goals: an end to majority rule, since an educated and informed majority would never agree to their proposals and programs. But through deceptive practices, and the use of clever wording (e.g. “right to work” rather than “anti-union”), and naming those who require government assistance, including the unemployed and the elderly, as “takers,” they plant the seeds that have already taken root, with the hope that they will eventually destroy the social contract the government implemented with the citizenry during the New Deal, and which has grown for the good of the majority since then. Democracy in Chains should be read by every thinking person in the United States. It is disturbing, revealing, and vitally important.